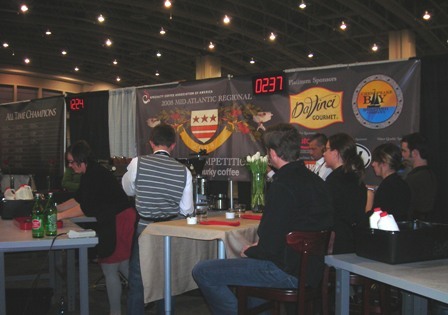 At 2:15 pm this afternoon Emily Jackson took the stage for her first barista competition. Emily did great! She finished all 12 of her espresso drinks in the 15 min time regulation. And from what we could tell as spectators her espresso shots looked good. Emily’s presentation to the judges was strong – she showed good coffee knowledge, good barista skills and had a confident presence during her performance. Then, at 4:45pm Braden Walter was next to take the stage for Tazza D’Oro. And Braden did great! All 12 drinks were completed in 15 minutes, the shots looked good and Braden, as always, displayed his usual pleasant demeanor in front of the judges. 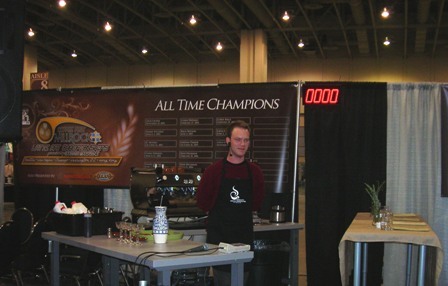 He spoke well about the blend of espresso he chose for the competition and his presentation of his espresso drinks went off well. I can tell you our nerves were high and the excitement even higher. Watching Emily and Braden get ready before the judges took their seats was one of those life moments I will probably never forget. Then, when Nick Cho announced their names, Tazza D’Oro and Pittsburgh – the emotions and pride… no words to describe. Tomorrow, another 12 baristas will compete in day 2 of the competition and at 4:30 pm they will announce the 6 finalists who will compete on Sunday for 1st, 2nd and 3rd place. BTW, there are a total of 27 competitors and 25 have the opportunity to move into the finals. The other 2 competitors are from the Mid-Atlantic region but chose to compete for the experience. The whole Tazza D’Oro crew is extremely proud of Emily and Braden for all of their time and commitment in preparation, being brave enough to compete in such a big venue without ever having seen a live competition and for showing us that they have raised the bar for the rest of us to continue to achieve great things. Also, thanks again to the folks at Batdorf and Bronson. Man o man, the espresso was so incredibly delicious today. Thanks for all the comments. We also had several folks who didn't comment on our blog but send many, many emails congratulating Emily and Braden. We promise to keep learning about our craft, improving on what we know and pushing for the next level. Congratulations Brady (and EJ and Amy)! The Walter clan is very proud of everyone and we can't wait to hear all about the DC adventure. Goooooood luck!